Boombotix, a startup based out of SF building rugged speakers for active lifestyle use, today launched a new Kickstarter campaign, this time for a new technology it’s building to complement it hardware products. The Boombotix Sync tech manages to synchronize audio from multiple mobile devices over 4G and Wi-Fi, allowing those to output to Bluetooth speakers and have the playback match for surround sound results. The tech was developed in response to user input – many asked the Mission-bases startup for a way to sync up a number of units for output to multiple endpoints at once. That’s not something that’s possible over Bluetooth, and I’ve seen other Kickstarter projects attempt and fail to make it happen with a custom-coded solution. But Boombotix saw another possible way: Building a protocol that allows multiple apps on multiple devices to playback audio simultaneously, so that more than one speaker can join in on the action. It works a bit like FM radio, Boombotix VP of Product Management Chris McKelroy says, so that more than one user can tune in at once and here the same feed played back at the same time. It’s not a perfect solution (they’re building in TrueWireless for two speaker, single device connections), but it’s one that will help users reach “critical mass” according to McKleroy, which means a whole team going out for a mountain bike race, or a group of kayakers, for instance, can all bring their speakers and listen along to the same stuff at the same time, as you can see briefly in the video. McKelroy says it’s amazing witnessing huge groups of people riding by, with “Boombots in perfect sync pumping 90+ db.” Also, you can flashmob with this pretty perfectly, if that’s what you’re into. McKelroy says that this tech is going to be kept proprietary to Boombotix products in the short term, rather than being made an open protocol, for instance. And this is just the first step in terms of networking hardware. 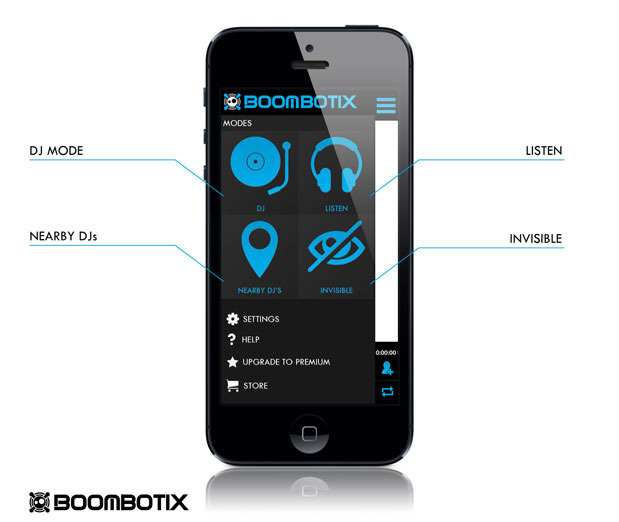 Boombotix is keenly aware that users want to use one device to broadcast to many speakers at once. “A fully networked device ecosystem is paramount to our goals,” he says, and suggests watching for more hardware developments from the startup to help make this a reality in the coming months. For now, the Kickstarter project for the music sync app is seeking $15,000 to help finish development, with Boombot speakers available to backers starting at the $55 pledge level.